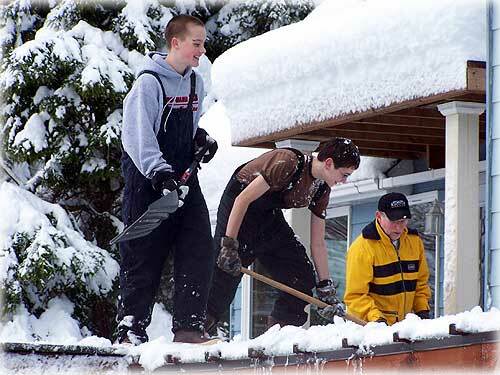 12-year old Beau Albertson-Elliott and Aaron Tippets pitch in to shovel snow for a neighbor who - like most in Ketchikan - was way over his head in snow. Ketchikan Public Works crews are working around the clock to remove accumulated snow and snow berms from all areas of town. They are finding snow forts and tunnels built by children in some of those snow piles. Parents please advise your children not to build their forts in these snow piles. Families watching snow removal are advised to also stand clear of heavy equipment. These vehicles have limited visibility and are difficult to stop on snow and ice. Ketchikan: Ketchikan Supported Alaska Statehood, Eventually; Chronicle, Daily News Fought The Battle Locally By DAVE KIFFER - Ketchikan, Alaska - When legislation creating the state of Alaska passed the US Congress on June 30, 1958, several hundred residents of Ketchikan gathered at the corner of Mission and Front Streets for an impromptu celebration. Forty-nine toasts were made, a 49 gun salute was fired and a 49-vehicle parade circled the downtown area, according to a report the next day in the Ketchikan Daily News. But Ketchikan hadn't always been so keen on the idea of self-determination for Alaska. In fact, in the early years of the decades-long battle for statehood, many local residents had been strongly opposed to the idea. The battle for statehood in Ketchikan was also the battle - to the death eventually - between Ketchikan's two newspapers, the Daily News and the Chronicle. From the 1920s to the early 1950s, Ketchikan was the center of the Alaska canned salmon industry and the industry - and its lobbyists - were adamantly opposed to statehood, primarily because pro-statehood forces were opposed to the fish traps that were the economic engine of the industry. Floating fish traps were placed at the mouths of creeks - and along other salmon migration paths ­ each summer. They funneled the returning salmon into holding pens from which they were scooped ­ or brailed ­ into the holds of large boats and taken to the canneries. Federal laws required that the traps could only operate on limited hours to allow enough fish to get up the streams and ensure future runs, but those laws were widely ignored. At the height of the industry ­ in the mid 1930s ­ the traps provided enough fish to support more than a dozen canneries in Ketchikan alone and more than twenty other canneries in the rest of Southeast Alaska. By the 1940s, the once spectacular salmon runs were rapidly decreasing. Statehood proponents seized on the issue as a sign that federal managers were "mismanaging" the resources and that Alaskans would do better. The first person to suggest "statehood" for Alaska, was the person primarily responsible for the purchase of Alaska from Russia in the first place, US Sec. of State William Henry Seward. In a speech given at Sitka on August 12, 1868, Seward said " the political society to be constituted here, first as a Territory, and ultimately as a state or many states, will prove a worthy constituency of the Republic." The next person to pick up the banner of statehood was one of the first territorial governors, A.P. Swineford in Sitka in 1887. Alaska: Governor Palin Welcomes International Diplomats - Alaska Governor Sarah Palin on Friday welcomed an international delegation of diplomats who travelled to Alaska to celebrate Alaska Statehood Day on January 3, 2009. Representatives from several Asian and European countries accepted Governor Palin's invitation to participate in weekend celebrations marking the 50th anniversary of Alaska being admitted to the Union. Alaska: PFD Application Period Opened Jan. 1st - The 2009 PFD application period opened January 1, 2009. To encourage more Alaskans to apply online, the PFD Division is continuing its commitment to pay early online filers first. Applicants who apply online in January, and qualify for direct deposit, will be paid in early October, 2009. The checks will be mailed in November, 2009. Alaska: Governor Palin Welcomes Her First Grandchild - Alaska Governor Sarah Palin has welcomed her first grandchild, Tripp Easton Mitchell Johnston, born to Bristol Palin and Levi Johnston on December 27. "We are over the moon with the arrival of this healthy, beautiful baby," Governor Palin said. "The road ahead for this young couple will not be easy, but nothing worthwhile is ever easy. Bristol and Levi are committed to accomplish what millions of other young parents have accomplished, to provide a loving and secure environment for their child. They are both hard workers, they're very strong, and have faith they've made the right decision in setting aside their own interests to make this child their highest priority." Alaska: Valkenburg, Rossi Join ADF&G Leadership Team - Alaska Department of Fish and Game (ADF&G) Commissioner Denby Lloyd announced Wednesday the appointment of Patrick Valkenburg as Deputy Commissioner and Corey Rossi as Assistant Commissioner in the Alaska Department of Fish and Game (ADF&G). "Patrick and Corey bring experience, expertise and leadership to the department as we work to expand our abundance-based wildlife management programs, said Lloyd. "We look forward to their contributions. Southeast Alaska: PRELIMINARY RESULTS: NO LINK YET TO ANCIENT HUMAN REMAINS - Preliminary results from DNA research on ancient human remains discovered in Southeast Alaska did not establish a genetic connection to potential living descendants from the region. However, scientists are not ruling out eventually finding a genetic link between Southeast Natives and the 10,300-year-old man, who was given the name Shuká Kaa (Man Before Us) by Native people in September at his burial. "It is important to note that the mitochondrial DNA test only addressed direct maternal ancestry," said Washington State University Molecular Anthropologist Dr. Brian Kemp, lead researcher for the project. "It is still possible other DNA markers could connect present-day indigenous Southeastern Alaskans to Shuká Kaa. However, these were not tested for." Metlakatla: IFA to Serve Metlakatla - The Inter-Island Ferry Authority's M/V Stikine will be providing daily Ketchikan- Metlakatla- Ketchikan service from January 8 through January 12, announced IFA general manager Bruce Jones. Alternate service to the Annette Island community will be provided during the period when the M/V Lituya will be out of service for scheduled maintenance, said Jones. The Stikine will depart Ketchikan at 11:30am, arriving Metlakatla at 2:00pm (Metlakatla time), departing Metlakatla at 2:30pm and returning to Ketchikan at 3:00pm (times are stated in Alaska Standard Time; Metlakatla observes Pacific Time). One way fares on the Stikine will be the same as those in effect on the Lituya. The IFA will collect fares aboard the vessel. Ketchikan: Alternative Health and Nutrition Interest Group Spearhead By Local - A local nurse plans to bring her interest in alternative medicine to others who want to add another component to their routine to stay healthy. Registered Nurse Elise Burger is spearheading a monthly discussion group set to start in mid-January. Burger plans to provide information and support to encourage people to make healthy choices and take more responsibility for their health; "Especially" Burger says, "with the high cost of health care, preventative measures should, and could, play a huge role". Thank you for your patience. With the snow still falling, snow removal is consuming a great deal of my time daily. Letters are in the publication file and will be published. All of your letters are appreciated. Thank you for understanding my time limitiations. Mary Kauffman, Editor, Webmaster, etc. Ketchikan Community Chorus Chrismas Program By Judith Green - On Sunday afternoon, a lovely cold clear afternoon, and wonderful choral music was heard at the Presbyterian Church by the Ketchikan Community Chorus, directed by Steve Kinney. If You Don't Volunteer, You Can't Complain! By Charlotte L. Glover - I was glad to see Diane Naab's letter explaining the position of the downtown Christmas tree. I attended the tree lighting ceremony with two very excited little boys. We enjoyed the singing of the Tongass School, the free refreshments and we were happy to be out of the rain in the spacious covered shelter. The free holiday stockings full of fruit, nuts and toys were deluxe.Those of us who actually PARTICIPATED in the event had nothing but happy smiles on our faces. I think the Chamber of Commerce and the Downtown Steering Committee did a fabulous job at kicking off our holiday season. And I know Sockeye Sams and Tongass Trading sure did not mind the many of us who took time to shop that afternoon while we were on the dock! - More..